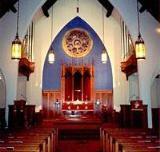 Worship is at the heart of our community life at First and St. Stephen's United Church of Christ. Corporate worship is the place we come together as a diverse people to join in a common journey. Our worship combines the richness of historical liturgies with fresh, dynamic words and community participation. Music is another important thread in the fabric of our worship. We value preaching that engages and challenges. We emerge from our common worship experience knowing ourselves to be valued and loved persons in service and in the daily living of our lives. Childcare is provided for younger children during the worship service. Children and youth begin and end worship in the sactuary. During "classroom worship", the younger children act out Biblical stories and learn to play together while the older children and youth spend time learning about different prayer styles, ways of reading scripture, and types of worship. Children and youth also serve as acolyltes during the service. On the first Sundays of each month, the youth serve as liturgists. Holy Communion is the first Sunday of each month and special days. Fellowship time with refreshments follows the service each Sunday. Taking Faith Home... for the weekly spiritual journey!